The soils here, on the bottom of the Plain, are quite alkaline and nutritively poor. These bare areas occur almost randomly and aren’t the result of foot traffic. While technically termed a grassland, across much of the Monument grasses appear to be a minor player, occurring much more frequently lower on the framing hills. It makes one wonder what do the cattle eat? I imagine much of this was never farmed either. Dry land farming was always a chancy endeavor in the West. Places like the Millican Valley, east of Bend, OR and points south, were the sites of many a failed dream and such farms, after much promotion and the aid of several moist, milder than normal years. I don’t know the history of dry-land farming on the Plain, but it must have been difficult. Semi-arid grasslands in general are fragile landscapes. Plowing them can lead to a rapid loss of organic matter and with it the ability to retain soil moisture reducing one’s chances for success even more. The native people left here after having been resident here for centuries. Is it drier today??? 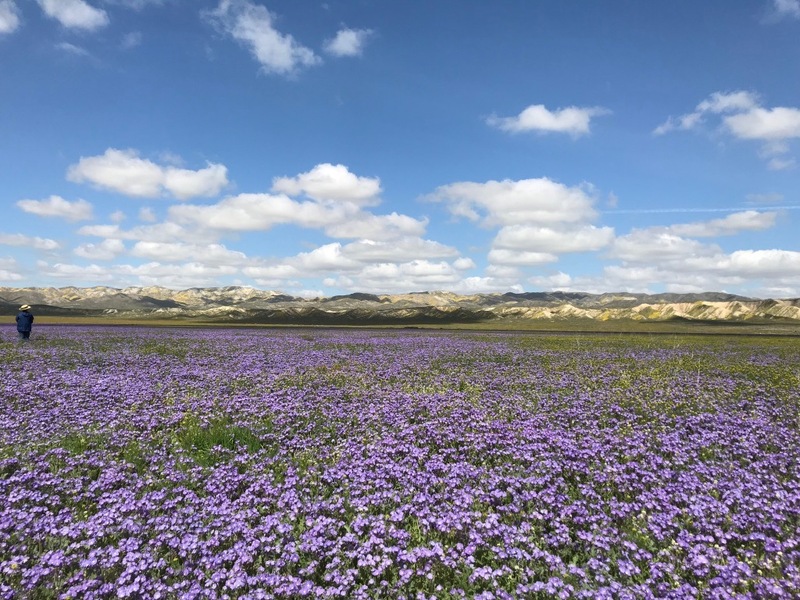 Why go visit the Carrizo Plain National Monument?…it is the last, significant, mostly intact, natural grass land in the state of California and puts on a floral performance that can be a showstopper when weather patterns produce sufficient rain over winter and early spring. This area was largely overlooked as the much larger Sacramento, San Joaquin and Salinas Valleys, also natural grasslands, attracted the interest of agriculture and settlers. The intensity and scale of agriculture in those valleys is mind-boggling, almost numbing. Today the big three support only small remnants of their former native biotic communities…much like the Willamette Valley here in Oregon…but Carrizo is different, largely because of its geology and elevation, two factors which strongly effected both the soils and weather, making it less attractive to agriculture and isolating it from markets. 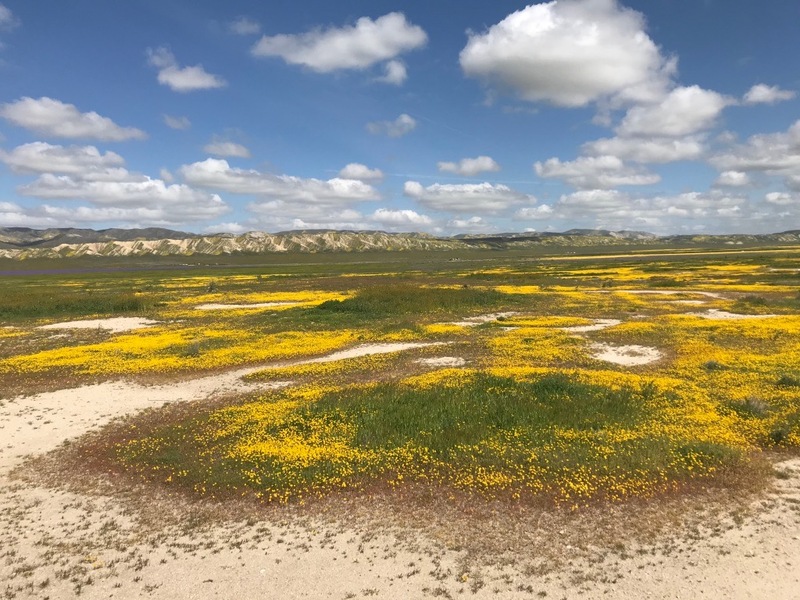 Carrizo Plain, not ‘Chorizo’ as my brain kept ‘correcting’ it to, is worth a visit for the geology alone…this Spring’s super-bloom, ’19, was a bonus. I’m pretty good with maps, but maps cannot really give you a sense of the feel and scale of a place like this. The National Monument is around 50 miles long and 10 miles across narrowing down at its southeastern end, including some 250,000 acres, and in much of it you can see for may unobstructed miles…it is a ‘plain’ after all. It lies within a valley, a basin more specifically, between the Temblor Mountains to its east and the Caliente Mountains to the west. The San Andreas Fault runs its length along its eastern side northerly to San Francisco and through Tomales Bay and south to the Salton Sea and the Gulf of California. The Elkhorn Scarp defines much of the eastern edge of the fault line, heaved up along the southern 2/3 of its length, formed when pressure forced the ‘edge’ of the Continental Plate upward. Soda Lake, toward its north end is the low point at 1,900′ elevation while the the Scarp, heaved up to 2,500′ at its southerly end, gives a person the sense that the plain is much narrower than it actually is because it blocks your view looking east from Soda Lake Rd, the main north south access road for the monument. It ‘hides’ a higher, narrower portion of the plain, squeezed between the base of the Temblors and the Scarp, from your view. The rains that fall on this arid landscape have eroded the face of the Scarp and the mountains, giving them a smooth sculpted and muscular look, cut with countless washes that fill quickly with rain draining out to the plain below where it percs down into the soil or evaporates away. Much of the eroded surfaces of the Scarp and Temblors look ‘white’ and are bare soil. The bottom ‘flat’ of the Plain is built up with alluvial sediments washed in from the hills and mountains to a depth of 3,000′. This makes for a highly erodable soil. The Plain is an endorheic basin, without an outlet, so all the sediments and ‘salts’, that leach from the framing hills and mountains, concentrate in the basin, resulting in the Plain and Soda Lake, a salty and alkaline lake in the north end. Long ago, before the plain uplifted, the area drained toward the south, flowing through the area where the present day town of Maricopa has grown. Its flow switched to north until further uplifting ended that, creating the bowl or basin that it is today. Driving Soda Lake Rd the sliding San Andreas Fault’s effects are evident. They claim that the fault moves 1.3” per year, but it doesn’t do this evenly. Like our subduction fault off of the coast of Oregon there is considerable friction, so the two surfaces tend to stay ‘stuck’, releasing occasionally when the Pacific Plate, upon which Soda Lake Rd and the western portion of the plain are located, suddenly slide north. Its erratic ‘release’ is evident in the creeks that wear down through the Scarp where at the bottom, the upper and lower portions, now no longer continuous having been offset, the creek having had to erode away the ‘softer’ material along the fault line to continue on through its old channel creating a sudden zig then zag. There is an interpretive trail we didn’t take at Wallace Creek, but you can see the evidence of some of these shifts along the face of the Scarp when driving Soda Lake Rd. Creek flow after storms can be heavy as the water drains away quickly with only thin soils and little vegetation to slow it. Washes like this occur frequently in desert country throughout the Southwest US and can be very dangerous for the unaware. We drove the Elkhorn Rd north making a loop on our visit, a single lane, dirt road that lies at the base of the Temblor Mountains with the Elkhorn Scarp bracketing it to its west, creating its own ‘valley’. Traffic is discouraged from driving this road unless it is in high clearance, four wheel drive vehicles, let’s here it for our Subaru Crosstrek…for good reason, as sections can be treacherous, muddy, slick and deeply rutted, while a several mile section at the south end is quite steep and narrow as well. There are very few pullouts for passing oncoming cars anywhere along its entire 40 miles of length….Much of it is windy and slow, beautiful in its own way. If it has rained however, this road becomes impassable for several days until the surface has sufficiently dried and firmed up…none of it is paved or even built up with with gravel so it can quickly transform into a soft slickened mess! Another issue can be the ‘washes’ that carry the heavy runoff from the Temblors, the road often drops suddenly and steeply into them before rebounding just as quickly up the other side, with the deepest ruts in the bottom, which follows, since that is where the road bed/soil remains wettest the longest. 4-wd traffic can slice deep ruts as they pass over it before the road dries and firms up, resulting in hard deep ruts that last long after for others to negotiate. Rising up out of the draws there can be an abrupt line at the top making it nearly impossible to see any distance ahead…on coming traffic could be on you almost instantly….We loved it. It would have been hell if much of the Soda Lake traffic attempted this even with dry conditions. The views are generally shorter than the Soda Lake Rd. side, due to the Elkhorn Scarp, but to us, this is the more beautiful part of the Plains, in part because there were fewer visitors…it was less ‘spoiled’. This was our first stop as we entered the Monument from the north on Soda Lake Rd…people taking pictures of themselves in Coreopsis, Tickseed, and Goldfields, Lasthenia smashing trails, as this was coming up to the first weekend of the ‘Super-Bloom’ season we could imagine the extent of damage as others pushed further out in search of their moment! While taking pictures in this area I had to wait for others to clear as they kept moving out further. A side note: The Southern California media has been promoting the ‘super-bloom’, in its several desert areas, regularly this Spring…hyping it! The result is heavy visitation to areas with very limited infrastructure, i.e., few and poor roads, only two campgrounds here in Carrizo, featuring pit toilets, though they aren’t stinky and are well maintained, no electricity and, more importantly, no water! Other areas include Anza Borrego, Joshua Tree, the Palm Springs area, Coachella Valley and notably, the Lake Elsinore area, which has been absolutely overwhelmed by the sheer volume of visitors. Add this to the limited ‘resource’ that they’ve all come to see and….While it’s great that people come to enjoy the ‘natural splendor’, it is obvious that many of them are absolutely oblivious to the impacts they might have on the area and any kind of reciprocal obligation or responsibility they may have simply to help preserve the health and vitality of these places let alone assure that the floral experience isn’t ruined for those who follow…. In one area, south of the KCL Campground, named for an old ranch, there was a huge several acre swath of almost ‘pure’ blue-purple Phacelia ciliata that created a shimmering splash many acres in size, that you could see from several miles away. Staff had put in a ‘road’ to it and created an informal small parking area from which you could walk 1/2 a mile to its edge. Once down to the edge people were creating more paths ever further into the flowers, of course stomping many down along their way. There were many people we noticed, in particularly picturesque areas, dressed more fashionably than you would expect, as if to meet friends, not out wild flowering in a remote area. Several people around me remarked sadly, that these people were chasing their perfect Instagram moments, taking picture after picture, not of the flowers so much as themselves in them. We saw this pattern along the most travelled roads where ever there were remarkable masses on the bottomland of the plains and on the lower hillsides. It wasn’t just the Instagramers, we saw people set up their chairs for lunch walking through the flowers as if they were there just for them to enjoy their moment! I’m quite sure that the truck we saw flip a “U” turn smashing down a section of previously untrammeled plants wasn’t the only one.…Several people commented to me that it was a good thing we got there early in the bloom cycle, speculating that by the following weekend, much might be ruined!!! It is simply impossible for the few Park Rangers on staff to monitor the thousands of visitors spread across the more than 400 sq. mi. of the Monument. We have a major problem in this country with people who are so disconnected from nature that they think nothing of the effects their actions have on the whole, never bothering to think of the many thousands of others who may be doing the same thing! I don’t want you to think we didn’t enjoy it. The place is incredible. We entered Carrizo from the north having driven the 45 miles on Hwy 58 out of Santa Margarita passed the several huge parcels of the Topaz Solar Farm. [These properties having been converted from ranch lands to the sterile and barren land required by electrical utilities, a ‘green’ production method that absolutely devastates all the biotic communities. While solar PV power production may not add to the atmosphere’s carbon load directly it is not without its costs!] The Plain impresses us immediately in its scale. We drive several miles before Soda Lake comes into view. Little color shows at first, patches of yellow Goldfields, or Lasthenia californica, Amsinckia and other ubiquitous little yellow Asters. That’s unfair! My expectations were high having seen beautiful pics posted of the ’17 super-bloom. It took me a bit of time to recalibrate. As an American I too suffer sometimes from the desire for instant gratification…to be impressed immediately. Next to the lake is a little ‘pimple’ of a mound with a trail to the top, to give visitors a higher vantage point, of both the lake and Plain, cars parked at its base, people out, cameras ‘clicking away’, the Temblors rising to the east, accented with patches of yellow, smeared on different faces, the broad reflective surface of the Lake below. It’s late afternoon and we’re headed to the Visitors Center for maps and information only we arrive their just in time for their 4:00 closing. Camping here has caused us, me, a little anxiety as there are only two small campgrounds and with the ‘super-bloom’ in process, I am a little concerned they may have already filled. Other than them, the website stated generally that primitive camping was allowed along the side roads pushing up towards the Caliente and Temblor Mountains, where ever the ground showed evidence of previous camping, i.e., you couldn’t drive through open areas and park where ever you liked, plus you had to carry out all of your own trash, bring your own water and by responsible for your ‘waste’….There also wasn’t any camping allowed along the main roads out in the flat of the Plain and your aren’t allowed to block or impede the roads that give access to the ranching operations that are still undergoing…that’s my read on the ‘rules’ anyway. Where ever you choose to camp, there are no fees! This was a very common scene in the hills in which sclerophyllous shrubs dominate, with Artemisia californica and Salvia leucophylla very common here, and we would find, over much of the arid parts of California, even near the drier coastal areas. Calochortus its single leaf generally fades before flowering in late spring/early June. These sandstone rocks ‘poke up’ almost randomly here. In the distance you can just see ‘Painted Rock’ a native American historical site with paintings that date back more than 3,000years ago. This is also a nesting site for hawks and visitation is limited. Painted Rock is accessed near the Goodwin Education Center near Soda Lake. Quercus turbinella Grey oak, Shrub live oak, the leaves an inch or so. The leaves are very tough and leathery, all seem to have these spiny margins, not just the juvenile leaves. Just love the light and clouds in this picture. Phacelia tanacetafolia. We only saw this species on the hills. P. ciliata was down on the flat bottomland. Our Subaru endorsement moment on the road down from Caliente Ridge. Quercus turbinella Grey oak, Shrub live oak. Not very common in California, the population in the Mojave has been assigned to a different species, this is more common as a desert species into Arizona and north into southern Colorado. A shrubby species this one may have gotten to 8′-10′ high. This was actually the only plant of this we saw, though we did not hike into the hills that much. Amsinckia, these are everywhere, at least in part due to the areas grazing history as cows avoided it allowing it to multiply. I later learned there are some 8 species here in the Monument, all ‘bristly’ members of the Borage family. We headed for Selby Campground, the closest one to the Education Center, a little further south and 3 miles off of Soda Lake Rd. climbing up into the hills abutting the Caliente Range, passed what turned out to be a common scene of deteriorating water tanks, an old barn tucked into a draw, out of some of the wind, to an area that had been graded off level. Turns out the site had been where ARCO had drilled a test well, and then abandoned it as they couldn’t find enough oil and gas to make extraction profitable, good for us, so we and about 15 other vehicles had space for mostly level camping. (The oil industry has drilled multiple unsuccessful wells here in the Monument, none ever productive enough, while east of the Temblors, in the San Joaquin Valley, producing wells are everywhere. Oil and ranching both get people’s political hackles up here.) We had a good view of the Plains probably 300′-400’ below us. The view was expansive across the Plain and southerly. The Temblors seemed to disappear in the distance. We picked a spot, visited with our neighbors in their custom Isuzu Fuzo diesel truck, 4-wheel drive expedition rig, it was ‘crazy’, and the proud owners would take it literally anywhere, before setting up our much more modest car top tent and then went for a short hike to a hilltop above us for a more expansive view and a look at the hillside flora, which was much more diverse than what I’d noted below. The bottom flat of the Plain is meadow with Steppe type landscapes with shrubby Oak and Juniper absent, increasingly common in the lower hills, more common as you ascend, with a mixture of sclerophyllous shrubs and forbs. The floor of the Plains Monument supports very few trees of any size at all anywhere within its boundaries other than around the old ranch sites. It had become obvious to me already that we were early in the cycle of the ‘Super-Bloom’, with many plants emerging, still far from flowering. Up here too there didn’t seem to be the conditions that supported the huge multi-acre sweeps where a small handful of wildflowers species were going to dominate. This was a more mixed and complex community. The Blue Dicks that were everywhere in the Pinnacles were here also, but in much less concentrated numbers. There was also the strappy foliage of what I assumed was another Lily family member, not even close to flowering, no scape or bud showing above the foliage. I wondered if it was Calcahortus and noted that I needed to check this out. Phacelia was scattered in small patches and individually, a plant in larger masses on the disturbed, sloping, fill side of our campground, we’d later see a different species of Phacelia blooming in masses of many thousands down on the Plains themselves. Up here, in these hills you can look and see the wider landscape of textures as the pattern and massing of plants, the scattered, weathered rock out-croppings, caught the late day sun making the surface variations jump out in contrast. Much of this would last after the bloom was gone and it is a feature of these kinds of more arid landscapes that many who are more attuned to wetter, more productive landscapes, don’t see or appreciate, but Julie and I, both residents of desert landscapes first, have always seen and enjoyed, thin landscapes that turn sere, tan and gray, dried in the summer sun and often preserved through the cold of winter. Color, even greens, often play a brief, but at times spectacular role in places like this, that can quickly yield to the colors of the soil and rock itself. This is a landscape primed with winter rains for its short extravagant display, which can often test the observer, with stingy displays of small flowers in drier years. While flowering plants, the Angiosperms, have their season for flowering, in arid regions in particular, plants must often be more patient, waiting for years before they invest the energy into germinating, growing and blooming, capable of passing many years, as seed or growing conservatively to maintain themselves, if they are perennial, conserving their one chance for years, if they are annuals, until the pattern of rain and its intensity can coax them into germination and growth. Much of the ‘super-bloom’ is comprised of flashy annuals, uniquely adapted to the heavier rain patterns that hop and skip through the years. Perennials can grow more robustly during these years as well, but it is the annuals in particular, that benefit most from these heavier rains, and whose existence are dependent upon them. Some flowering bulbs also must be frugal growing, conservatively during what turns out to be dry years, skipping their bloom cycle. To ignore drought years is a death sentence. These annuals grow quickly and then are gone once having spread their seed or replenished. Perennial herbaceous plants and woodies have evolved other survival strategies. Pholistoma membranaceum is an annual herb with a waxy, fleshy, bristly stem and branching profusely, sometimes forming a tangle. The inflorescence bears 2 to 10 flowers each under a centimeter wide. The flower is white, usually with a purple spot or streak on each of its five lobes. The leaves are deeply lobed or cut and borne on winged stalks. The foliage is coated in hairs. White Fiesta Flower, Pholistoma membranaceum, is a member of the finely bristled Borage family. Its another one of the many annuals that star here during the super-blooms, though this one is a side player where it can sometimes romp up into larger shrubby neighbors. Annuals are highly responsive to and dependent upon adequate winter and spring rains. One of our ‘neighbors’ was here for the ‘super-bloom’ in ’17 and spoke of how then, when they visited, the hills were awash in color above us and on the distant Temblors, displaying a wider range of colors, more varied yellows, the orange of California Poppies, blues and purples, but on this day we appeared to be earlier in the cycle and those colors hadn’t appeared yet. A Ranger, on our next day here said that the Poppies weren’t really resident to the lower flat Plain, growing on the higher slopes, but in this particular spot, we didn’t see any of their finely cut, characteristic, foliage growth. We decided that, tomorrow, we would take the road climbing further up to the trailhead that we could follow up above Caliente Ridge to the peak above 5,100’ to see what we could see. People were friendly in camp, more so than usual, I expect because we all share an interest in what was happening here. This was a different group, willing to primitive camp, albeit we all had our gear and widely varying accoutrements and vehicles. Tomorrow we would meet the day-trippers, and they would be the majority, who wouldn’t stay, who weren’t equipped, or interested in that kind of ‘relationship’ with such a place…only in the ‘pretty flowers’! Talk was of ‘equipment’ and previous experiences here and similar places with cautions concerning the masses who would be attracted to this event. I imagine it like the solar eclipse that tracked its way across Oregon drawing people locally, regionally and internationally. People shared information, which roads were passable, it had rained 2 days before, but not very heavily, which the Monument’s website warned everyone about (There were also regularly updated information boards near many of the road junctions with a daily list of roads that were closed so people could adapt plans on the spot without having to get stuck first.) One camper gifted us with her printed out copy of two tours of the Plains geology that explained at least some of what helped shape this place that we would refer to as we drove the loop the length of the Plains and back. The next morning we packed up and headed toward Caliente Ridge stopping at a pull out higher up which offered the view to the north we didn’t have from camp with its islands of massive rock poking up out of the Plains here and there with their characteristic pale color and rounded forms. One was the Painted Rock formation which was closed to protect nesting hawks, open only by very limited guided tour, which also features ancient native paintings produced by the former native inhabitants. Two other couples were stopped here and we visited with the one we had met previously as they others prepared to drive down…that couple had driven up to the trailhead and walked it only a short way before the trail surface, which hadn’t sufficiently dried, dissuaded them, the still wet clay quickly sticking to and building up on their boots….we decided to look for adventure elsewhere. We drove south on Soda Lake Rd. stopping at a few places where there were little spur roads to promontories for views and a chance to see different vegetation. The Plain itself was almost monotonous in its pattern dominated by the few yellow flowering Aster species and the Yellow Fiddlenecks, the plant that we would decide later was by far the most common, its school bus yellow tiny flowers held in its spiraled inflorescence becoming recognizable from far away, hundreds of yards, subtly tinting the entire landscape. About 9.5 miles south of the Education Center, before you get to the KCL campground, is an almost perfectly conical hill standing alone on the west side of Soda Springs Rd. It is a volcanic vent on the ‘tour’ of the Monument’s geology. A trail leads up to the top and we stopped to see what we could see which included some beautiful views on this cloudy morning. Here the coarse soil supported a dynamic mix of broad-leaved perennials and annuals. Higher vantage points give a greater sense of the vastness of this landscape. The only other campground here is KCL, several miles further south, on the site of the old abandoned, KCL ranch with its few remaining trees, similarly sized and equally primitive and clean. On approach there were several other short ‘roads’, that would likely fill up with campers. We used the facilities and then headed up a trail, maybe a 1/3 of a mile long up a couple stair stepping hills noting both flowers we hadn’t seen before and with a view to some kind of ranch operation a mile or two further up into the mountains. There are signs around imploring visitors to respect the property of private owners/ranchers. I’m a little unclear how this ‘works’ as I thought the Monument was all BLM property, but on many such properties ranchers have leases, which environmentalists often contest, wanting either stricter management rules enforced, or the ranchers gone…while the ranchers, who once shared the Plain with dryland farmers who often grew wheat, want longer, more secure leases…(A similar situation occurs, we discovered, when we visited Point Reyes National Seashore). Some make the argument that longer leases will give ranchers a greater incentive to improve their practices as it will benefit them, but with short term leases….I wondered how much of the Monument might be open to grazing as managing for cattle has different priorities with effects on the flora and whole biotic community. I thought of this as here we began to see Locoweed or Milk Vetch, Astragalas, in the flora mix, a plant very toxic to cattle, a genus including multiple species all quite beautiful, five of them found here on the Monument. Here I also noted the same strappy foliage of the Calochortus preparing for its late spring flowering, with scattered Blue Dicks. ‘New’ here to me, was a tiny Lupine, Lupinus bicolor, with tiny dark blue and white flowers, the whole plant only a couple inches tall growing in what was a slightly wetter saddle between the two hills. Nearby was a budded, but yet to bloom taller and more robust species of Delphinium, probably parryi. These hills supported a wide variety of little annuals growing in a matrix with scattered bunch grasses, which I would never attempt to identify here. As on the flat of the Plain itself the soil here is coarse, stony with relatively little organic material. I suspect that most visitors are here to see the ‘super-bloom’ not these widely scattered and often tiny plants…they’re here for the impressive masses of color. (Here’s a link to a Cal Flora site that has a list and links to 413 plant species here in the Monument compiled by the Nature Conservancy who have been instrumental in the Monument’s history.) While here we met a young couple driving northerly who told us to stop at the large patch of ‘blue’…Where is it?…’Oh, you can’t miss it!’…so, we set off for it thinking we would have lunch there as well. There are 11 different Atriplex spp., Salt Brush, this one is probably A. spinifolia, the Mojave Saltbush. My understanding is that all of ths species occur more commonly as you move to the south end of the Plain. The genus tends to occur on alkaline soils where salts concentrate like here in basins. A. spinifolia tends to occur in more arid areas like the Mojave. Atriplex spinifolia with more leaf detail and its twiggy spiney structrues. Astragalus oxyphysus; Mt. Diablo Milk-vetch above KCL Campground, Carrizo Plain. These generally stand alone or are widely spaced. Much of the lower hills are completely untreed with little woody shrubs either. The soil, as you can see, is very thin and stony. The flat plain of the Monument has very little to no Calfornia Poppy, Eschscholzia. What we saw on the hills were small and few, only just coming into bloom when we visited. This is very unlike the Antelope Valley to the east of the Temblors where they are a dominant element. the rolling ascending hills leading up to the Caliente Range. The road to the far left is the acesss to a still operating ranch operation, there are several on the Monument. You can see the patchy pattern made of sclerophyllous shrubs, no doubt indicative of the soils immediately below them. These include the Saltbush, Artemisia, bushy Senecio and the common Californian Salvia leucophyllya, all different species than you would find on our similar looking Columbia Plateau lands. This was a lone Delphinium parryi was budded up and ready to boom. Here you can see the small fine cut leaves of Lupinus bicolor mixed in amongst other plants. This annual Lupine, Lupinus bicolor, is only about 3″ tall, but it caught my eye anyway walking through. It can be a common elelment in the mixed prairie community like here where there is not a thick ‘sod’ of perennial grass. The ‘Blue’ shimmered and floated in the distance, even at over 2 miles away. it was off of the main road, along a spur the BLM had created to limit and control the spread of people who they no doubt knew would want to visit it. I imagine since soil conditions don’t change in any significant way here from year to year, that these large patches of species has some consistency as well, returning as conditions permit, with other species, players, taking a more dominant role as the season progresses. To really ‘see’ this place you would need to spend the entire bloom cycle here probably driving hundreds of miles over it to take it all in. Driving the ‘loop’ we did once is over 80 miles. This was our most serious encounter with the ‘visitors’ I described above. Amongst the serious wildflower people were the much larger group who were here to see the pretty flowers, here for the experience, here because…well, why not!, because it was a thing to do. It was incredible…and disturbing. Above all I think now, that it was a missed opportunity, an failure to engage these people in a way that might awaken at least some to this wonder around them, their responsibility to it and the losses that places like this, the Sacramento, San Joaquin and Salinas Valleys have suffered, their landscapes sacrificed to agriculture and development and the remaining wild places that must endure our ever increasing human population and its recreational ‘needs’, stressing these places we need and love….. Enough! We stopped at Traver Ranch, one must take advantage of the meager ‘facilities’ offered, where I read a little of the relatively brief history of the family’s attempts to make a life here as ‘dry land’ farmers growing grain. Their abandoned farm equipment slowly rusts in the arid environment nearby while the old structures continue to waste away, the concrete block house still standing proudly, but neglected its windows boarded over to keep ‘us’ out and protect the bats that have been roosting there, claiming it as their home. I didn’t finish reading when some guy walked up to me wanting to talk, telling me how he’s been coming here regularly for 25 years, I suspect to impress me some how with his ‘credentials’, and began to talk about how poorly maintained everything was, how poor, the BLM was I presume, that they weren’t maintaining the old house. In fact he told me that in all of his years coming, he’d never seen a Park Ranger! I told him that was odd, that I’d just spoken to one who was posting information about road conditions a few hours earlier….I suspect that he was harboring resentments about all of the city people who were despoiling the Plains to which he felt he had somehow ‘earned’ a kind of ownership. He grumbled and drove away. Julie later expressed sympathy for the two teens sitting in the back seat of his car. Close to the face of the Scarp. On this trip the north facing slopes were often covered in Goldfields. Goldfields, lake, south end of Soda Lake Rd., Carrizo Plain. The hills just beyond the ‘pond’ are where Elkhorn Rd. climbs up to the other, narrow, side of the Plain. Continuing south of Soda Lake Rd the landscape continues to impress, if not the flowers, the landforms themselves. The Plain here narrows substantially and the road, after gradually climbing for much of its length, begins to lose elevation more quickly, becoming hilly all around us also carrying us closer to Elkhorn Scarp with its eroded and rounded ‘edge’ sometimes ‘ablaze’ with large swatches of Goldfields. Saltbush, so we were told, becomes the dominant shrub species. The Plain continues dropping with the hills closing in on both sides of the road. There’s a ‘pond’ surrounded on three sides by the rising ground without an outlet surrounded by crusty alkali flats. When we reach the roads terminus with Hwy 166 we realize we missed our turnoff on to Elkhorn Rd and know immediately where it is, back where the hazard signs stood out prominently, but otherwise unidentified, marking the beginning of a narrow, one lane, dirt road heading up into the hills. We thought it was interesting that all along Soda Lake Rd. we passed small signed roads that appeared no where on the map distributed to visitors, but when we got to Elkhorn Rd., the only north/south passage on the east, Temblor side of the Plains, it was unmarked. In retrospect we decided this was intentional, to discourage the more casual driver from attempting it! The thin curling ribbon of the road adds itself fittingly to the landscape here on the Scarp. Light and landform are always one of the dominant elements of arid and semi-arid landscapes. Having grown up in such a place I have an affinity for them that many people from more ‘lushly vegetated’ landscapes often don’t seem to have. The fencing and gate like this one, is a reminder that cattle ranching still occurs here. Carrizo Plain, Elkhorn Rd. The Road, for most of its entire length north is a defining element of the landscape, given the closeness, the nearness of the Scarp’s dominant ‘edge’ to our west and the Temblors themselves to our east. It cuts a narrow, fluid line ahead curving and climbing, suddenly dropping across the landscape almost like bleached out bone. We follow the contours as we approach with the kind of abrupt changes inherent to a simple road engineering formula aware of the narrow margin between cost and benefit that goes with a little traveled dirt road, subject to the sudden erosive changes of flooding…the road must yield, adapt to the conditions without the need or will to impose a more rigid and fixed route across the land. The absence of car traffic is notable and the few number of conventional cars that pass us head south, the compact sedans, the Tesla, leave us shaking our heads thinking about their 40mile drive which will end with the roughest most abrupt section of road. The Temblors feel much like the old and worn coastal mountains characteristic of much of California, rounded, ‘smooth’, almost muscular with one significant change, the almost ‘bleached’ looking exposed and eroded surfaces, mostly barren, washed from much of their steeper slopes, accented, on the more northerly surfaces with swaths of yellow. These eroded surfaces share a common angle of repose, that almost of gravel piles and crumbling surfaces, that themselves can’t support an angle any steeper. A steeper slope will cause the ‘material’ to slough and tumble down. It gives the mountains and hills a common, rhythmic pattern and form of their own very unlike the hard rock mountains of the Sierra Nevada to the east and elsewhere. Over here, as in the Caliente Range, the several other colors of wildflowers we were hoping for, have not yet appeared…not in mass, and we settle, contentedly for the colors of arid land foliage, muted to protect the plants from water loss. Coming down out of the hills at the southern end this narrower plain or bench is absolutely dominated by literally billions of Fiddleneck, Amsinckia spp., giving its yellow-orange cast to the landscape. In places, closer to the toe of the Temblors is a huge swath of blue/purple of Phacelia ciliata, the same as the one we came across just south of the KCL Campground, smaller here, but filling more of the immediate landscape. A single narrow dirt road cuts across it off of the Elkhorn and appears to disappear into a gully leading up into the mountains. We can see a single car on the other side, but no others and no people out in the flowers making their Instagram moments. We go out into it about midway, on the road, and no where have people walked trails. We are happy to be here. Continuing on, the bench is dominated by the Fiddleneck, mile after mile. The Temblors present a continuous changing pattern of rounded mountains, never quite the same, a running panorama of photo moments. The road here has settled into a pattern of long fluid stretches, not quite straight, responsive to the terrain, but eventually the ground shifts lifting, curving and dropping and the scrub/steppe pattern takes over dropping in and out of washes. We pass the northern end of the Elkhorn Scarp, where it merges with the lower Plain and the landscape opens up across its entirety. We can see across to the Caliente Range their details blued and faded in the distance. At this point we realize that there must have been a road that broke off to the west that we missed, that somehow cut down through the Scarp to the field of blue we visited from the Soda Lake Rd side. When we were over there we could see cars in the distance a few miles away at the base of the Scarp. We had thought this road would have taken us there, but it didn’t. We had passed other roads, but they weren’t signed and nothing showed up on our map. I didn’t worry too much about that and we got into a rhythm rising in and out of washes shallow and deep, broad and abrupt when I had Julie stop the car. We were in a shallow wash where I spotted Desert Candles, Caulanthus inflatus, blooming, an early Spring blooming Brassica, that I’d never seen growing in situ before and had not grown myself…but, it’s such a distinctive and weird looking thing that I identified it immediately at 25mph. I’ve always been this way, struggled with learning so many plants, repeatedly looking them up, checking, not recalling for certain when I see them…and then these others I read of once, see a picture of, or see grown one time somewhere, and years later see it again, and have an immediate, OMG! moment. Memory is indeed a funny thing! 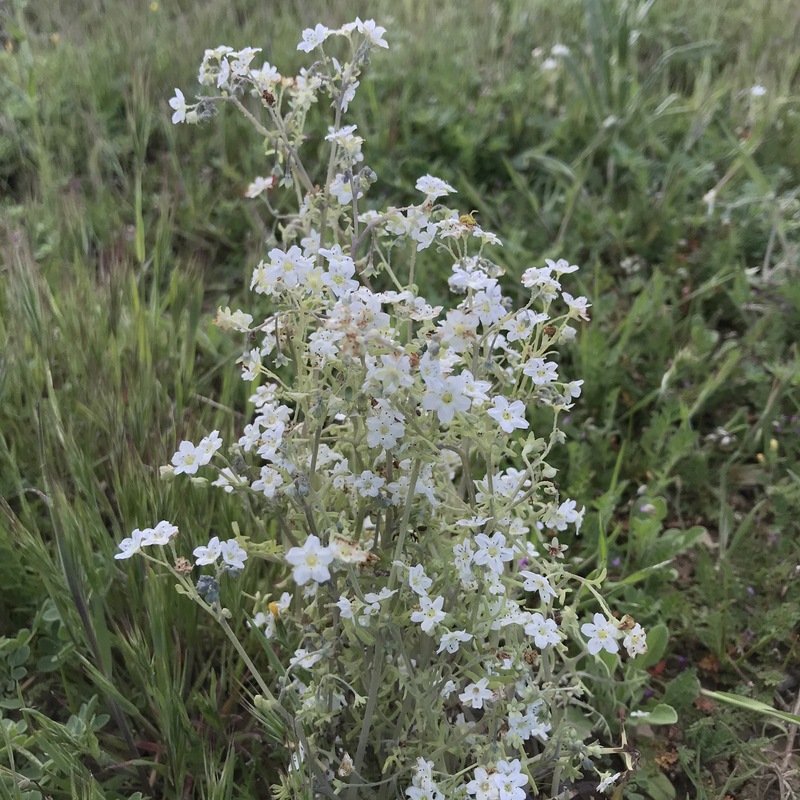 There was this one scattered patch of these, across maybe a 1/2 mile or so of road, growing in coarse gravelly soil, a single component, not dominant at all. This annual is short lived, biding its time in spring for germination and then bolting in the offered heat, before quickly finishing…it is a very transitory thing. Blink and its gone. There is no large basal rosette. There was a few remnants of earlier plants, long dead, dried, with their ‘inflated’ flowering stems hollow, broken and stiff, still in evidence. I don’t know if this plant has it in itself to bloom every year or if it must patiently wait for the heavier precipitation that portends and enables a ‘super-bloom’. If you choose to drive Elkhorn Rd from the north end be forewarned that the ‘worst’ portion of the road is the far south portion and if it’s too much for your vehicle you will have to turn around and drive the whole way back. Seven Mile Rd, one of the cross connectors was opened and they opened Simmler a little to its south, but Panorama, which crosses near the south end of Soda Lake, remained closed. The question, would I go back…yes! If you are interested you should make this at least a 2 night trip…more if you plan to hike…much more if you want to see the progressive bloom of wildflowers. I understand that the super-bloom covers a 3-4 week period, so it would make sense to make several return trips over that with side trips to Pinnacles National Park, Antelope Valley, to see the massive bloom of California Poppy, the Mojave, Anza Borego, Coachella, the Palm Springs area and the several botanic gardens in the region, Santa Barbara, UC Santa Cruz not to mention all of the nurseries in the region carrying native and exotic plants….There is much to see and do and many miles of curvy roads to drive without getting into the insanity of the LA area. If you go to Calflora, on line, they have a species list for Carrizo Plain Preserve, I’m not sure if that’s some smaller area within the National Monument, it provides links to 413 species and can provide you with a lot of help in sorting between the various species and subspecies…there are 6 different Amsinckia listed, an annual that can dominate in disturbed areas, aided by the fact that grazing cattle avoid it and so ‘select’ for it. This goes to why this genus seems so dominant in large areas and along many of the road ways. Looking for a link that can tell you about what might be going on now in the desert SW? that can give you more information on the species found there…then check of the Desert Wildflower site! While Carrizo Plain is not a true desert, it is semi-arid, there is overlap with some of these plants and this is a good resource for those of you going on to the Mojave, Anza Borrego, etc. For more reason to go there visit the Nature Conservancy’s site! The Conservancy is heavily involved in its management having been involved since 1988, working with the BLM and the California Department of Fish and Game, and the first 82,000 acre purchase, which has expanded to its present 250,000….I find it a little strange that the banner photo on their webpage shows a woman standing out in the middle of blooming Phacelia! The picture seems to give permission to visitors to do the same! For a little historical context and the political situation surrounding the National Monument with regards to the Trump administration’s ‘threats’ to them, see this article on Conservation Atlas. 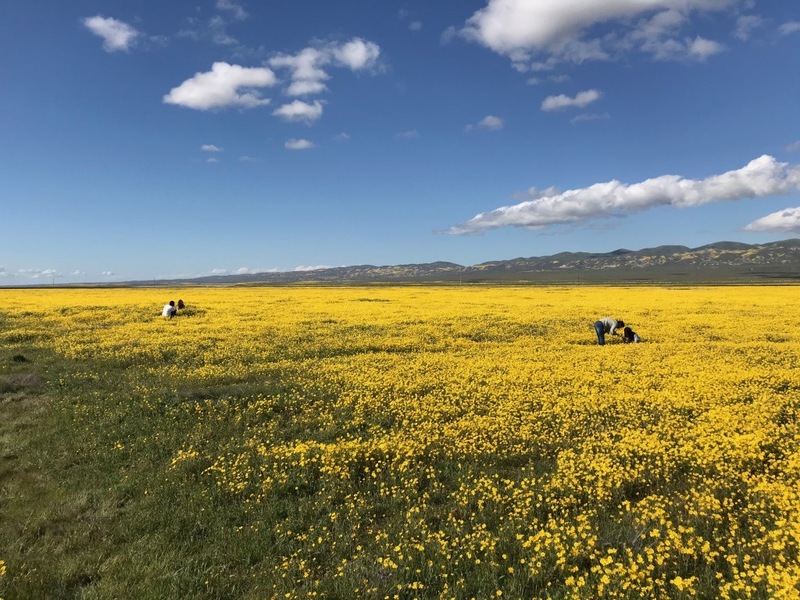 This entry was posted in Climate, Natural Areas, Parks and tagged California wildflowers, Carrizo Plain, Super Bloom on April 16, 2019 by gardenriots.